Join us for a festive evening of fun! Antur’s Christmas fair, Miri Siôn Corn, will take place on Friday 30 November, at 6:00pm. The event will feature stalls selling gifts, mulled cider, mince pies, raffle, and a chance to meet Santa himself! 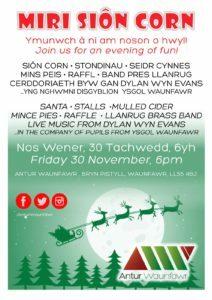 Pupils from Ysgol Waunfawr will be singing carols, and there will also be live music from Llanrug Brass Band and Dylan Wyn Evans. So why not get into the Christmas spirit this year and join in with Antur’s festive celebrations!